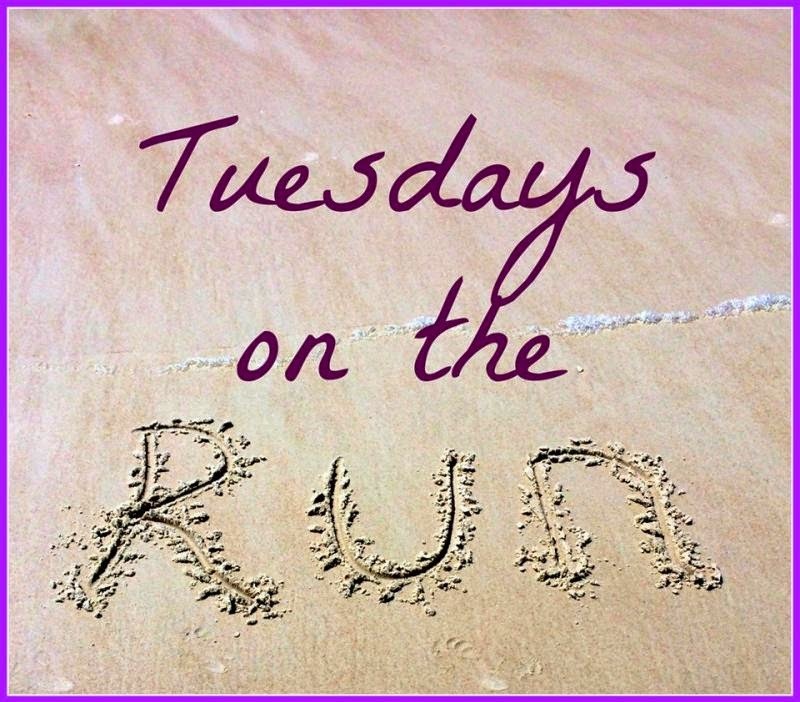 The theme for this Tuesday's Tuesdays on the Run is "Safety". Runner, Walker, and bike safety is SO important. Last week I had just heard of another resident in my area that was hit by a truck and killed while walking her dog. Such a sad story. When I think about being safe while running, I always think about the safest route possible. 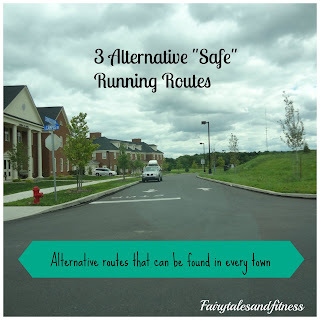 I came up with these safe places to run a while ago but thought I would share them again for Tuesday's "Safety" theme. 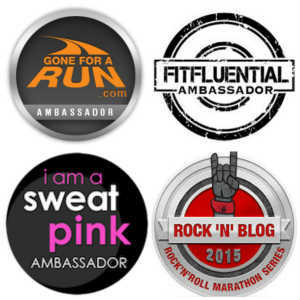 If you’ve read my previous running posts then you know that I am pretty particular about where I run. I don’t like having to stop at red lights or worrying about dodging traffic. Therefore I always run in a park or on a trail. This summer the heat on my favorite trail made it almost unbearable to run on because there was very little shade there. This had me on the search for alternative places where I could run safely. Here are a few alternatives I came up with. I live fairly close to a campground, I don’t know why I hadn’t thought of this one before. This is perfect for those really hot days because there is plenty of shade. I’ve run at our local campground during the week and I didn’t have to contend with any cars on my route. I imagine the weekends are a busier time. One possible downside, If you run at the campground early in the morning you may still smell remnants of some campfires the night before which can be kind of unpleasant ( unless you like that smell). I’m local to one of these as well. As well as having nice shaded paths, a college campus is probably one of the safest places to run ( especially if you are running alone). Campus Security is always around somewhere, and most campus’s have those call boxes for emergency situations ( but most people have their cell phones anyway). Another upside to running on campus is the paths are always well maintained and you get a good a variety of level land and inclines! I don’t know about where you live, but I have not experienced a college or university on the East Coast that does not have at least one hill on it! I know this might sound a bit creepy, but really no one will bother you here! Most cemeteries are shaded with mature trees and landscaping. There’s no traffic, and quite honestly there is just something peaceful about running in a cemetery. As summer is coming to an end, we may not have such a need for shadier places to run, but I will continue to run at these spots ( in addition to My Favorite Park and Trail ) because of the safety factors. A fellow runner shared this on Facebook yesterday and with her permission I am sharing it here. "I was walking down my street yesterday getting set to take off on my run! I heard a lot of noises behind me like people were having a good time! I turned slightly to look over my right shoulder just to see two motorcycles coming toward me. One man closest to me had his hand out and was reaching for my hind end! Talk about frightening! That gave me a freaky feeling! But once I started running my pace picked up! What gives someone the right to do that? The more I think about it, the angrier I get!" You certainly don’t want something like this happening to you. Another reason you need to find a safe place to run! Thank you April, Patty, and Erika for hosting this link up! Where is your safe place to run? Please share. For security reasons, I always carry a spray with me (for dogs or humans) and vary my times and neighborhood route. It can be scary running as a solo female. Do you live near Bucknell? My daughter attended college there! I live near a park preserve, so I do enjoy those running trails. As a solo female, I do not get up early in the summer to beat the heat. I just don't know what's out there. College campus is a great idea! We have a gorgeous one about 30 min away from us (Rice Univ.) and they always have tons of runners/walkers on their main trail! I love having alternate routes. Mixing it up makes it fun when running starts to get monotonous. Glad you have some! I love running in our cemetery. It's connected to the park and no one is ever there. No cars and a nice paved road to run on! Karen, Glad to see someone "gets" the whole running through the cemetery! I am always so cautious when going out and really try to pay attention to the traffic, etc. These are great suggestions! I try to run through the university and it's beautiful + it's nice knowing there are so many people around. College campus yes that's a good idea! Cemetery ooh I don't know that would freak me out. Creative though! These are great suggestions for running areas. I try to stick to the trails most of the time because that is what is closest to me. I much prefer running in nature over running on the roads. I never thought about any of those options! They're really good suggestions. I also have a neighborhood near me that has a park with a half mile running/walking path. It feels really safe since there are always people there and it's surrounded by houses on all sides. That's where I generally go when I'm running alone. I stay safe in my neighborhood.... low traffic and people around. I don't run at night. I love running on a nice flat hard packed sand beach too. The track is good, though boring.... LOL, but hey, safety first. Running outside as a solo female is always scary. My husband and I used to run together more, but since he's cut back on his running I've been doing a lot more solo runs. When on the trail, I always carry my pepper spray in my hand. Although its gotten some interesting looks from other runners and walkers, I'd rather be safe than sorry! I always feel safe running around my neighborhood. It could be a false sense of security, but I have done it bright and early when it is dark out and even at like 3am when I have had insomnia. There are always people with lights on in their houses, people walking their dogs, people on their porches smoking cigarettes... Houses are close together and I just feel safe! I think a lot about safety when I run. Thankfully, I usually run at work and we work in a really populated area and I run along the water which is all segregated from vehicles. I feel so badly for that woman and her family, thanks for sharing some more great places to take our running! Thanks for the great post. Many people shy away from walking/running/etc. As they don't think they have a safe place to do so. I love walking with my Girls at the local schools and college campus track, as well as the cemetary. I know a lot of people run through the local cemetery, but I never could!! Even though it is THE perfect spot for hill repeats. My favorite is a school track. It is also great to round up friends and run because everyone can be different paces and still be "together"
I have a park somewhat close by within driving distance that I love to run at because there are always runners there, and lots of them! I feel very safe but never let down my guard at the same time. A college campus is a great alternative! I've been wanting to start walking around my neighbor with my dog. My mom was worried about safety as well. I still have yet to find a route that's good. Walking with your dog is an excellent idea. Is he a big dog? college campus is a great idea! especially great in the summer or on winter break when they are not that busy yet there is still people there! I love running on college campuses! I am lucky to live close to the UW-Madison campus with tons of trails and lots of active people all over the place- so motivating! Yes, college campuses are great to run on ( especially if you can find flat ones)! I had a pretty scary "stranger danger" incident running late at night a couple of years ago. I live in Arizona and it can still be over 100 at 9pm. Since then, I've run with a whistle and my phone in my hand. There's a police precinct attached to a park near my house about a mile away. If I'm running later at night, I now drive to the park instead of running through dark neighborhoods. There's constant police traffic, so I feel pretty safe. Good post! Oh the park near the police precinct sounds like a fabulous place to run. Instant Safety! Great ideas! I would add to make sure the path is lit if you are running at night, even (and maybe especially for some) on a college campus. Thanks for sharing! I try not to run at night, but good tip! Thanks. Love my cemetery runs! New Orleans has many, and they are her famous above ground "cities of the dead". In fact, one of the street car lines that starts downtown ends at the Cemeteries stop (that's where I have to take it if I take it home - to the Cemeteries please...nice place to go, huh? lol). Some of them are still kind of shady (and not in a good way for summer, if you know what I mean), and being above ground there are many hiding places. St Louis #1, just outside the French Quarter, is bordered by the Iberville Projects. Still have to be aware! But I do love running in them! In the spring, there is an entire 5K that's run in one of the cemeteries...very fun race!! Might be a great place for a GROUP run! LOL on the cemetery! I live near a seminary - that should be safe too! Yes, I would bet SO safe. Is that open to the public? I like to think most of the trails I run on are safe, but I very rarely run alone to make sure that I am safe!! Sometimes runner's become too comfortable on "their" trail and they become more vulnerable because they are less aware. 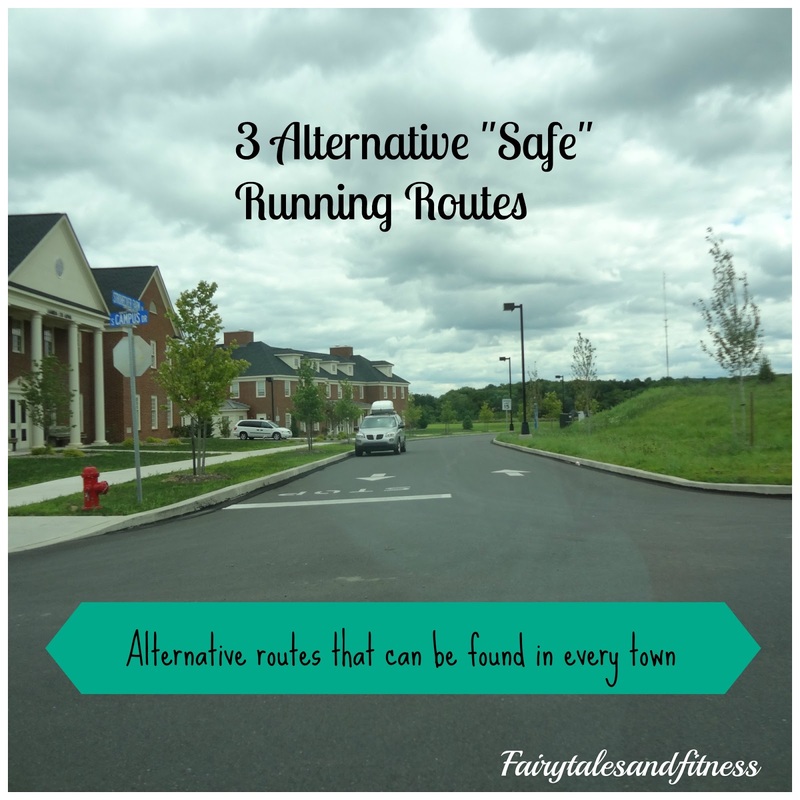 Great alternate route ideas! I run around my house but thankfully there's no traffic or red lights nearby. I would have never thought of a cemetery but you're right, it's nice and quiet and peaceful! A cemetery provides a nice peaceful run. It doesn't always give much mileage! Great tips! A safe route makes such a difference. I really should run on the UF campus more often, it has lots of hills and is very safe. Thanks for linking up with us! I had just started running when I was in FL, but I was in Tampa by then. Had never though of the campus, though! And you're right, when I lived in Ocala there were quite a few rolling hills in the area! I can't wait to get back up to school specifically because it's a built-in safe place to run! Never thought about campgrounds before, but that's an awesome idea! Why is it that college campuses always have hills? Both my undergrad and grad school are perched atop hills. There's a huge, beautiful cemetery in Brooklyn, Greenwood Cemetery, that would be perfect for running. But running isn't allowed out of respect for visitors who might be grieving or visiting the departed. They opened it one day last year when Obama's visit shut down nearby Prospect Park that most runners frequent. Fairytales and Fitness is a personal blog authored and edited by us, Meranda and Lacey. The thoughts expressed here represent only our own and are not meant to be taken as professional advice. Please note that our thoughts and opinions change from time to time. We consider this a necessary consequence of having an open mind in an ever changing society. Any thoughts and opinions expressed within our out-of-date posts may not be the same, nor even similar, to those we may express today. 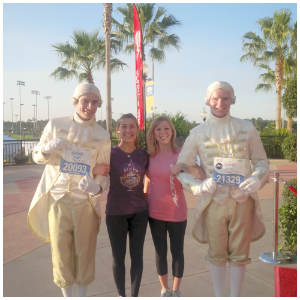 We are two sisters who are runners and Disney lovers. On this blog we tell our stories of traveling, training, races, ( and a few tips we've learned along the way). We talk about products we've tried and all the things that bring us joy (including our yellow Labradors). Thanks for visiting and we hope you enjoy what you read. 5 Ways to Soothe Sore and Tired Feet. Tinkerbell Race Weekend Hotel and Ticket Rates. I ran the Tussey Mountain 50 Miler Race!